A pilot project at Wilfrid Laurier University is exploring whether pedal power can also boost brain power. Two stationary bicycles sit on the third floor of the Bricker Academic Building on Laurier’s Waterloo campus for students who are looking to spin their way to self-regulation. Mueller found inspiration for the project, the first of its kind at a post-secondary institution, in a book by John Ratey, a neuropsychiatry expert and professor at Harvard Medical School. In Sparks: The Revolutionary New Science of Exercise and the Brain, Ratey says that aerobic activity helps people control their readiness to take in new information. Mueller, who holds a PhD in developmental psychology, says she is continually interested in how people learn. “I have always been curious about how the mind and the heart’s cardiovascular functions work together,” says Mueller. Mueller conducted research through Sparks Fly, a program organized by the not-for-profit organization Run for Life, which has placed thousands of stationary bikes in K-12 classrooms across North America. Findings were published in a co-authored report, “Learning in Motion: Teachers’ Perspectives on the Impact of Stationary Bike Use in the Classroom,” in 2017. 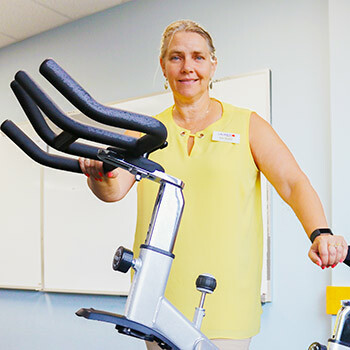 One hundred and seven Canadian teachers were surveyed about the learning outcomes of students who used classroom stationary bikes for self-regulation. Information was collected through a 44-question online survey, which asked about the bikes placement in the classroom, how often they were used, and perceived student outcomes. Teachers also gave feedback about students’ mental awareness, accomplishments and self-esteem in relation to bike use. Mueller’s report found that the bikes had a calming effect on some students while helped to energize others. Teachers also reported improved student focus. When asked if they would recommend the program to other teachers, 99 per cent of respondents answered yes. Mueller says those results encouraged her to work with the Sparks Fly program to bring the stationary bikes to Laurier. Long classes while seated in front of computers can lead to a sedentary approach to learning. Mueller hopes the bikes will encourage Laurier students to take a mind-body approach to learning new information.